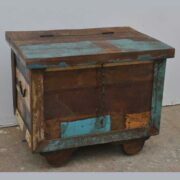 A cute little trunk made from small reclaimed pieces of salvaged woods. This is a unique trunk, no two would be the same! 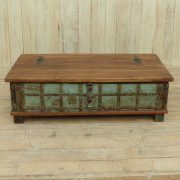 The front section has been constructed from old pieces of carved woods, a great way to recycle. These include vintage spindles which run down the edges, and various other blocks of wood, some coloured; blue, lime, red and cream. There is a black clasp on the front and two chunky handles on the sides. The lid of this piece is mainly cream and dusty green and opens up (held by a back stopper) to give a good storage area for your belongings.